Should the life of a chimpanzee — particularly one taught to use language — be sacrificed to save a man’s life? That’s the provocative moral question posed by the new novel Solomon’s Freedom by Dennis Meredith. In Solomon’s Freedom, flamboyant defense attorney Bobby Colter finds himself arguing for the life of a client quite different from his usual string of miscreants. Solomon is a chimpanzee, and a unique ambassador for his species. He has been taught from infancy to express himself using a touch-screen computer. His educator and champion is Dr. Abigail Philips, a dedicated scientist who took over research on chimp intelligence after her primatologist father died. But her laboratory is in financial peril, and billionaire media tycoon Walter Drake seems the ideal rescuer. He donates $10 million to the laboratory, in return for a seemingly innocuous stipulation. He asks for legal control of Solomon, promising to house the aging chimp comfortably in a spacious facility on his property, allowing Abby to continue her research. That is, until Solomon’s life will be sacrificed to save Drake’s. He had an ulterior motive. Research that Drake funded on tissue engineering will enable his scientists to “harvest” Solomon’s heart to use its extracellular scaffolding to grow a new heart for the ailing mogul, from his own cells. The success of the transplant would set a stunning precedent, encouraging the sacrifice of a thousand chimpanzees in sanctuaries for transplant donors. What’s more, Drake pledges to support preservation of wild chimpanzees and the breeding and “sustainable harvesting” of countless more for their organs. The lawyer Colter, hired by animal rights advocate Sarah Huntington — a foe of Drake, but also his estranged mother — finds himself embroiled in the most controversial and challenging case of his career. But the greatest influence on the novel arose from the time Meredith spent with the chimpanzees at Ohio State University’s Animal Care Center. Led by psychologist Sally Boysen, the research center was exploring the ability of chimpanzees to learn mathematical concepts. “The experience profoundly inspired me,” says Meredith. “I’d done all this literature research on chimps, but that didn’t prepare me for the personal experience of hanging out with them — pun intended. Chimps display extraordinary intelligence in the wild, but more revelatory for me was seeing them deftly solve arithmetical problems and show other intelligent behaviors that could only be termed human-like. Meredith also drew on the results of behavioral studies by Boysen and her colleagues that revealed the depths, and limits, of chimp intelligence. In one telling experiment, Boysen and her colleagues tested whether chimps who witnessed a miniature soda can being hidden in a model of a room could find the real soda can hidden in the actual room. Some of the chimps did find the hidden cans, showing that they possessed conceptual abilities related to language. Unfortunately for Boysen’s research, fiction turned out to follow a sad reality. The university subsequently shut down her laboratory for financial reasons and sent the animals to sanctuaries. 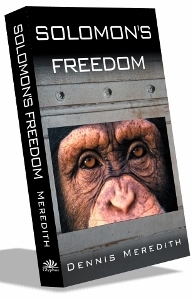 In honor of Boysen’s chimps, Meredith named the main human characters in his novel after them. While the fictional Solomon is adept at using language, a major question that the novel raises is whether real chimps could possibly master language. There have been studies indicating that chimps can understand and use language concepts. One such chimpanzee was Washoe, who was taught American Sign Language by researchers Allen and Beatrix Gardner. In other prominent experiments, primatologist Sue Savage-Rumbaugh and colleagues taught the bonobo Kanzi and others to learn some language using keyboard lexigrams. “However, there has never been a research project like the one described in Solomon’s Freedom, in which a chimpanzee has been intensively taught from infancy over decades to communicate using the rich medium of the touch screen,” says Meredith. “And there is some evidence that chimpanzees, like humans, have a ‘critical period’ in infancy in which they could readily absorb language,” he says. “So, I believe it entirely possible that if language-learning were begun early enough and with the right tool and enough time, chimps could exhibit substantial language abilities. However, given the cost and time involved, I doubt there ever will be such a study — which is a shame because of the scientific insights it would yield,” says Meredith. Dennis Meredith brings to his novels an expertise in science from his career as a science communicator at leading research universities, including MIT, Caltech, Cornell, Duke, and the University of Wisconsin. His nonfiction books include Explaining Research (Oxford 2010), and his previous novels are The Rainbow Virus (Glyphus, 2013) and Wormholes (Glyphus, 2013).